Whitechapel. The very name of this London neighborhood brings up a single image to those who know it but have never been here—an image of murder. Jack the Ripper and his murders of at least five prostitutes in the district has cast a historical stain on a part of London that is actually full of life. Food, art, music, and history abound in Whitechapel. Whatever you might be in the mood for, you can find it here, and it doesn’t have to involve the area’s most infamous resident. We’ve outlined ten of our favorite things to do in Whitechapel below, and you can let us know your own favorites in the comments. This famous bell foundry that had been open since 1570 and cast everything from handbells to church bells. Unfortunately, it has been closed since 2017, but you can still stop by and look at the outside of the place where America’s own Liberty Bell was first cast in 1752, Big Ben in 1856, and the Olympic Bell in 2012. The buildings were purchased by a developer who plans to turn the oldest parts of the foundry into a museum, so it will still be worth visiting in the future (but plans are up in the air right now due to public opposition to the whole project). The Ten Bells is one of the most historic pubs in Whitechapel, having existed on the site in one form or another since the mid-18th Century. The interior keeps the Victorian trappings from its last remodel and was made a Grade II Listed building in 1973. And while it serves fine ales and food, some history buffs will note that it has a connection to two of the Ripper’s victims, Annie Chapman and Mary Jane Kelly. The former of the two women supposedly haunts it still. Community gardens have sprung up in cities all over the world, and the Nomadic Community Garden in Whitechapel has its own unique style that sets it apart. It’s not just the plants themselves that will bring you to the garden, but the private spaces that the community members have made out of reusable materials from old couches to window frames. It’s one of the most singular places in London and not to be missed. Found by going through a fridge in The Breakfast Club’s Spitalfields location, the Mayor of Scaredy Cat Town is one of the city’s most colorful speakeasy bars. It’s hard to nail down exactly what the interior aesthetic is beyond “vaguely American,” with a stag’s head mounted on the wall along with American graffiti posters and neon signs, but of course with a distinct British flair. It’s retro throughout, but the drinks are quite modern and the service very friendly. Genesis Cinema is one of the best places in Whitechapel to watch a film. An independent movie theater, the prices are relatively cheap for you to watch any number of indie flicks or Hollywood blockbusters in the cinema’s big comfy chairs. For a bit extra, you also get table service and blankets. Depending on your night, you can grab soda and snacks or cocktails and a meal while you watch a film. 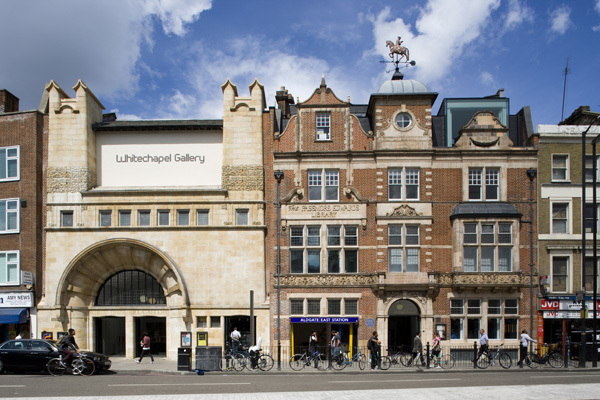 One of the oldest art galleries in the area, the Whitechapel Art Gallery has been going strong since 1901 when it first opened to the public. In that time, it has played host to the greats such as Pablo Picasso and Frida Kahlo and today favors local and lower-income artists to give their works a chance to shine. The building and its architecture are as much a piece of art as any of the paintings and sculptures inside, as Whitechapel gallery is a Grade II listed building. Whitechapel Market on the Whitechapel Road is one of the areas premiere food markets, where you can find any manner of fresh produce, meat, and bread. It also benefits heavily from the Bangladeshi and Asian communities of Whitechapel to provide a cornucopia of ingredients vital to any dish from both peoples. And of course, there are always some good street food options, so any foodie will want to hit the market and experience its wares. London has a number of urban farms that not only provide food to the local community but held educate children and adults alike about how farms work. Visitors can see and pet the animals, attend the farm demonstrations, and even enjoy what’s grown there in the farm’s café. If you want to do more, the farm also offers volunteer opportunities that will help contribute to its success. Certainly amongst the most noticeable skyscrapers in the city, 30 St. Mary Axe (known colloquially as “The Gherkin”) is a marvel of modern architecture with its glass panels and green building strategies. Mostly home to offices, it also has a number of restaurants, including Searcy’s on the highest floors of the building. As such, dining or shopping there is the only way you’ll get to enter the building, so if you want to have dinner with a view, it’s a good idea to make a reservation. Of course, it all comes back to this. Perhaps the main reason why tourists set foot in Whitechapel is London’s greatest unsolved mystery. A museum located on Cable Street is dedicated to the murders and the Met’s subsequent investigation, recreating many places where the slayings occurred and holding onto a number of important artefacts. There are a few walking tours available as well for those who want to see the locations up close and feature knowledgeable guides. Isn’t Dennis Seaver house in that area?